Reports from AHS members indicate that in North America daylily rust has successfully overwintered in USDA Hardiness Zone 7 and milder. At the current stage of our knowledge, it is safest to assume that if any daylily foliage remains green through the winter in an already infected garden, there is a possibility the rust could survive inside those leaves. In very mild winter climates the familiar yellow-orange powdery “summer spores” (urediospores) produced from the spots (pustules) on daylily leaves may cause repeated infection cycles year round. A spore is similar to a plant seed, and like a seed requires moisture and appropriate temperatures in order to germinate. It is not yet known how long daylily rust urediospores can remain alive on leaves until conditions become suitable for germination and infection, or exactly how far they can travel on the wind to new daylily leaves. Rust spores can often travel many miles on air currents. Another means by which rusts can overwinter is in the form of “winter spores” (teliospores). These are dark colored spores which most commonly appear at the end of the growing season in response to shorter days and cooler temperatures. 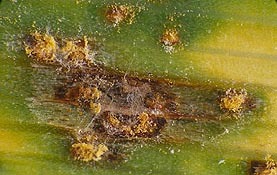 The spots and streaks containing teliospores on a daylily leaf are blackish, in contrast to the more familiar orange pustules of urediospores. “Winter spores” are hardier and more durable than the “summer spores” and lie dormant on dead daylily leaves over winter. In the spring they germinate to produce another type of spore but this cannot infect daylilies. Instead, these new spores must be transported by the wind or other means to a plant of the alternate host, Patrinia, which is a perennial plant also of Asian origin. After completing the next stage of the life cycle on a Patrinia plant, the rust can then pass back to daylilies. Thus it is possible that in climates where the rust cannot survive the winter as mycelium or urediospores, it may still be able to continue the infection in the subsequent year if there is a plant of Patrinia in the vicinity. When acquiring new daylilies, whether by trade or purchase, it should be born in mind that these plants could be carrying a rust infection even though it isn’t necessarily visible at the time of receipt. 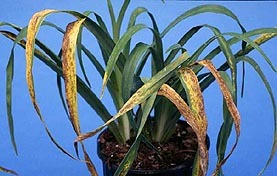 There have been numerous reports of rust first becoming apparent several weeks or months after the plants have arrived. The fungus may be alive inside a leaf, or spores be hiding on a leaf, without showing any obvious signs externally. An early infection may go undetected until the rust begins to form more spores, at which time it produces the characteristic yellow-orange pustules. From this point on, the infection may soon spread throughout one’s garden or nursery. It is advised as a precaution to isolate all new daylilies well away from existing daylily plantings for several months or a growing season to minimize rust spread if they turn out to be infected. On receipt of new daylilies, some growers are peeling the outer layers of leaves from new plants right to the crown, and then cutting the remainder about one to two inches above the crown. The plant may then be soaked in fungicide if desired. This procedure may add to the transplant and shipping shock of the divisions, and that risk should be weighed against the desire to protect one’s garden and neighborhood from possible rust infection. Although there is no guarantee this treatment will prevent rust on new plants which have been exposed to the disease, it should significantly reduce the risk. Fungicide or disinfectant treatment prior to shipping does not guarantee a rust-free plant, and overseas purchasers should not assume a phytosanitary certificate indicates a clean plant. Differences in rainfall, humidity, temperatures and cultural practices will cause the severity of the disease to vary between gardens. Because fungicide availability and labeling differs regionally it is best to contact your local Extension Service or Ministry of Agriculture for the most recent advice on treating daylily rust. Trial results from Drs. Buck and Williams-Woodward at the University of Georgia were published in the Spring 2002 issue of the AHS Daylily Journal. The summary indicated that “daylily rust can be controlled under greenhouse conditions by fungicide applications, in particular, mancozeb, chlorothalonil, azoxystrobin and triadimefon.” Products should be rotated to reduce the risk of fungicide resistance developing. Alternate between a systemic fungicide and a contact or protectant fungicide. Application may need to be repeated as often as every seven to fourteen days – follow product label instructions. It is often recommended to remove the foliage from all plants discovered to have rust at the first sign of infection, cutting just above the soil level. Similarly cut all apparently healthy plants in the vicinity. However, if the infection continues after this initial cutting back, it is not recommended to continue repeatedly removing all the foliage. For those who do not wish to use fungicides treatment may be limited to continuous removal of individual infected leaves as they are noticed. Removed leaves should be destroyed, preferably by burning or burying where this is possible. Spores can remain alive for a while even on a dead leaf and spread from there on the wind. Opinions differ regarding the safety of composting infected leaves. Some people are spraying the plants with a fungicide before cutting the leaves in order to reduce spore numbers around the remaining stubs of plants, and then spraying again afterwards. Fungicide applications will not be as effective if the foliage is not removed from the plants. Because leaf moisture for several hours promotes rust spore germination, overhead watering should be avoided wherever possible. If it cannot be avoided (by use of soaker hoses etc. which keep the foliage dry) then timing should be such that the leaves remain wet for the shortest possible time – i.e. do not overhead irrigate late in the day or in the evening. Also, plant spacing should be sufficient that leaves dry quickly following rain or irrigation.